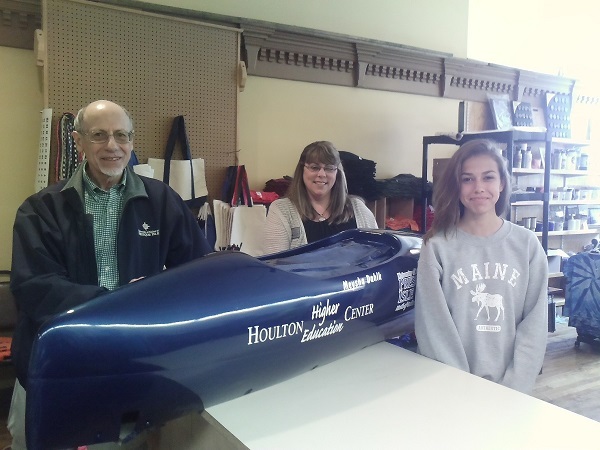 For the first time, the University of Maine at Presque Isle and Houlton Higher Education Center are taking part in the exciting world of soap box racing. 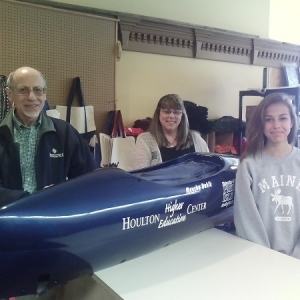 The University and its Houlton campus will co-sponsor a car in the annual Northern Maine Soap Box Derby race on Saturday, June 17 at Houlton’s Community Park. Frank Thompson, UMPI Assistant Professor of Psychology, has been involved with soap box racing since 1998 when his oldest grandson expressed interest in racing, but had no car or sponsor. Thompson became president of the Houlton Rotary Club the next year and asked the Rotary board to fund and sponsor a car. He and his grandson built the first Rotary derby car and participated in their first Northern Maine Soap Box Derby race. Since then, Thompson has sponsored and helped build various soap box cars and five of his six grandchildren have participated in the race at Community Park. He enjoys refurbishing old cars and teaching children how to repair soap box cars. He said that the races exemplify the All American Soapbox Derby Association’s motto: “Gravity Powered and STEM Driven,” STEM is an acronym for Science, Technology, Engineering and Mathematics. “The children who participate gain a healthy dose of technical knowledge by reading the plans, handling the tools, measuring, calculating the weight of the car, and taking part in building, upgrading, moving, storing, polishing, and maintaining their car,” Thompson said. During the 2016 derby race in Houlton, someone from the Bangor area donated a used superstock car to anyone who wanted to refurbish it. Thompson was not interested at first, but later found out that Meysha Dahlk, a derby competitor from Monticello, needed to move up to superstock, the largest category of soap box cars, after turning 14. After being refused by various businesses, Thompson asked UMPI President Ray Rice if UMPI would like to sponsor the car. Rice agreed and Tracy Rockwell, Director of the Houlton Higher Education Center, brought the Houlton Center on board as a co-sponsor. Thompson is co-sponsoring six derby cars this year, including the UMPI/HHEC superstock car. He replaced the car’s previous graphics with UMPI and HHEC decals, cleaned the shell (the body of the car) and repainted the car midnight blue. After Thompson obtained a new kit to refurbish the car’s floorboard, axles and other parts, Meysha and her father Steve Dahlk built the car’s undercarriage. Meysha has driven the Houlton Rotary Club car for the past four years and enjoys the mechanical aspects of soap box racing. The Northern Maine Soap Box Derby race began in Houlton in 1996 as a spinoff of a similar race held in Camden, Maine and is part of the International Soap Box Derby, an international nonprofit organization that strives to give children meaningful experiences through STEM education and leadership development. For more information about the Houlton race, please call (207) 532-8236.